George II (George Augustus, 10 November 1683 – 25 October 1760) was a British king. He was born in Germany. He was last British monarch born outside of Great Britain. He became King of Great Britain and King of Ireland. 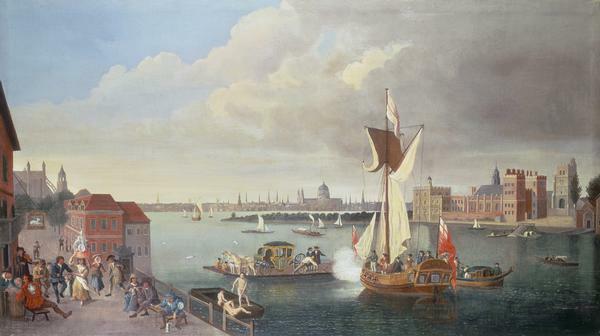 He was also Elector of Hanover. His son, Frederick, Prince of Wales died before he did. George II died of heart problems. 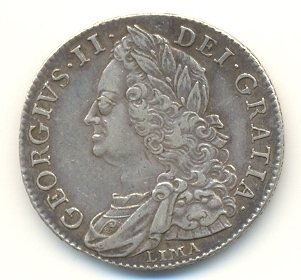 Half-Crown of George II, 1746. The inscription reads GEORGIUS II DEI GRATIA (George II by the Grace of God). The word LIMA under the king's head signifies that the coin was struck from silver seized from the Spanish treasure fleet off Lima, Peru, during the War of the Austrian Succession. 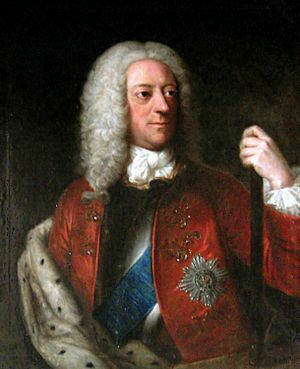 George said his son Prince William, Duke of Cumberland (pictured), had "ruined me and disgraced himself" at the Convention of Klosterzeven, 1757. George II of Great Britain Facts for Kids. Kiddle Encyclopedia.